This week's feature author, Dianne Wolfer, is having a very exciting year. Black Swan Productions are performing a play based on her book Lighthouse Girl (and also includes Light Horse Boy). Dianne says, "Tickets are selling fast for the Black Swan adaptation of Lighthouse Girl. The show opens at the Entertainment Centre in Albany (where the first two AIF convoys gathered in 1914 to travel to WW1) http://anzacalbany.com.au/ . Some soldiers were fortunate to come ashore (near where this play will be staged) and march, but most had to remain on their ships. Hence the signalling to Fay, the main protagonist in the Lighthouse Girl." You can read a blog post about the show here. After Albany the show will travel to Perth for a 2 week season. More information coming soon. The Anzac Stories: Behind the Pages Exhibition is going to Dianne's hometown of Albany in August. Dianne is giving talks at the local schools and libraries about Lighthouse Girl and Light Horse Boy, as well as talking about the exhibition. Based on the true story of Faye, this gentle tale brings to life the hardships of those left at home during the war – waiting, wondering, hoping. Drawing on fascinating archival material, and interweaving fact with fiction, award-winning author Dianne Wolfer deftly recreates this period in Australian history from the perspective of a young girl. Lighthouse Girl has featured in documentaries, Illuminart story projections and Fay provided inspiration for the Little Girl Giant in the amazing Royal De Luxe Theatre’s performance of The Giants. See Dianne’s personal gallery or follow this link for photographs. An Interview with Dianne and the team from Channel 9’s Destination WA on Breaksea Island gives further insights into Fay’s story and shows evocative scenes from the island. ‘The Lighthouse Girl’ by playwright Hellie Turner and Black Swan Theatre opens in Albany/Perth in April 2017. 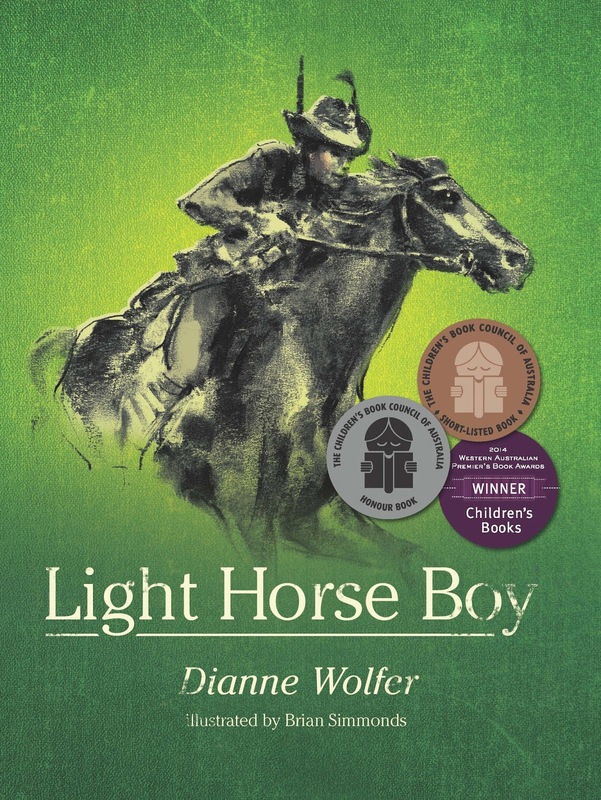 Light Horse Boy begins in 1914 when Jim and Charlie abandon the Australian outback for the excitement and adventure of the war to end all wars. But in the Light Horse they quickly discover the brutal realities of life on the front line. And nothing will ever be the same again.